Labour Party members have been invited to participate in the Party’s policy formation leading to Annual Conference 2016. The invitation came from Angela Eagle, Chair of Labour’s National Policy Forum (NPF), in an email of 7 April. Links were given to discussion documents for which responses are required by 8 June. This is an exceptionally short period for organising debate to produce responses. For example in 2014 the initial letter went out on 10 March with responses required by 16 June. What this means is that the period for debate responses has been curtailed by a month compared to 2014. Not only that but because of local and mayoral elections many branches and Constituency Labour Parties (CLPs) have cancelled meetings in this period. Getting responses in will be difficult. Forget the arguments about the value of the NPF for the moment. Some want it abolished and some (like me) want it reformed. But none of that matters right now. The point is that it is our only effective channel for influencing Party policy for now. We must therefore use it. 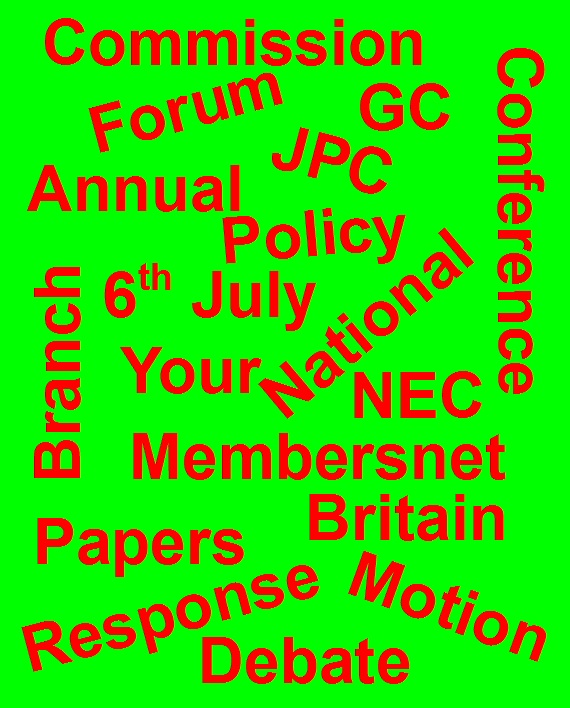 All affiliated organisations, the ALC, Young Labour and CLPs may submit motions to the NEC on campaigning and organisational issues and to the NPF and its policy commissions on policy issues throughout the year. The NEC and NPF shall consider such motions and report on action taken in their annual report to conference. This means that there is no limit to the number of responses which can be sent in. The important point to remember is that responses to the documents need to be in by 8 June. Don’t wait for others to produce responses for you. The more people who read these documents carefully and respond accordingly the better. Your CLP General Committee (GC) meeting of May (if there is one) is the latest one from which responses can be sent. This almost certainly means that your branch meetings of April/May (there may be only one) will be your last chance to contribute. Add to that, according to LP model rules motions should be sent to branch officials 10 days before the branch meeting. That makes for a very tight schedule. We are told on Your Britain that the Policy Commissions meet regularly “consider evidence and submissions, identify challenges, and develop Labour’s policy in these areas”. This is remarkable since no information is given as to the composition of the Commissions, the Chair of each, a contact email, the programme of meetings, reports of recent meetings, decisions taken. We ordinary members are kept completely in the dark and, it has to be said, this is less information than was available two years ago. Similarly there is an almost total lack of information on the Joint Policy Committee which is supposed to oversee the policy making process. We must to ask why information on all these bodies is not provided as a matter of course. Please request it. We have a right to know. There are seven policy documents up for consideration from the Policy Commissions covering (1) Economy, (2) Communities. (3) Health and Care Policy, (4) Children and Education, (5) Home Affairs, (6) Transport and (7) International Policy. In addition there is also a very sketchy outline of Labour’s policy processes. Each document has a text of around 800 – 1500 words with a series of questions for debate. I have read them all and in my view they are all anodyne in the extreme. What is lacking is precisely the big picture of what is happening to economic and social life under the Tories. (1) The Economy: Building a Productive Economy. This document is 730 words (without the suggested questions). If you take out waffle such as “The health of the British economy is vital to the prosperity of every household in the country” then the actual analysis is pretty thin. There is no hint at all of the New Economics thinking being developed by John McDonnell’s team. The problems are stated in hopelessly general terms: “The priority must be to tackle the big challenges facing our economy...”. They are answered in a similar vein: “To achieve this we must ensure that we boost productivity, that growth is shared across the country …”. (2) Communities: How can we increase the number of affordable homes to rent and buy? The main text of this document is just 850 words. Take the waffle out and again not much is left. In amongst the claims I could not help noticing “With Labour in government, we built two million homes”. That is a claim that Labour built, on average 15384 houses per year. What kind of a claim is that? I am no housing expert but I know that this is not particularly impressive. Look at the graph from Thatcher to Cameron. What is perhaps more to the point is that the government’s assault on local government through its austerity programme is not mentioned. A Labour alternative is therefore not discussed. (3) Health: Mental Health: the way forward. The main text is just over 1000 words. As the title suggests it focuses on mental health and does not discuss the general crisis in the health service. Even in that short compass the phrase “parity of esteem between mental and physical health” is used four times. It is a feel good phrase with no particular meaning, or so it seems to me. (4) Education: Delivering a step change in early intervention and the early years. This document is 1500 words long with the questions stripped out. However, it is loaded with anodyne statements like “Labour is developing a bigger vision for early education and childcare and looking at how we can develop a strategy to meet our aspiration of a world-class early years system”. Above all it is impossible to recognise in any of this the root and branch transformation of our education system being carried out by the Tories (e.g. forced academisation of all schools, parent governors banned). This is presumably being left for another year! (5) Home affairs: How should we reform the police to better tackle the crime and policing challenges of the future? This is the longest document with a main text of 1508 words. The title tells you that pressing issues, such as the migration crisis, are not up for consideration. There is a lot of talk about Tory cuts to the police service but no estimations of what it would cost to reverse the cuts. Banal statements like “Labour believes that everyone should feel safe in their home, at work, and in their communities” pad out the text. (6) Transport: How can we ensure our transport networks meet the needs of local communities? This document has a main text of 1275 words. It is particularly full of banal statements such as “In many parts of the UK the three major barriers to using public transport are affordability, availability and access”, “For too many people who rely on public transport the rising cost of fares is adding to the financial pressures they already face”, “It is important to also consider how to positively encourage people to use local services” and the like. If you are expecting to find some consideration of the popular demand for the public ownership of the railways here then get ready for a disappointment. Most of these documents focus on specific topics without considering the broader picture. In this way contentious issues are avoided and therefore remain unresolved. The level of analysis is throughout incredibly weak and there are no references to supporting information. The suggested questions are not generally a useful starting point for discussion. It would be really helpful if people with a good knowledge of the areas covered by the Policy Commissions were to put in responses with alternative proposals i.e. proposals not limited to the very narrow focus of most of these documents. How, for example can a serious political party in the UK in 2016 talk about education policy without talking about what is happening to our schools? If you have a particular interest in any one of the policy area outlined above and you have researched Labour Policy and the arguments from various points of view then why not offer your thoughts to Left Futures in the form of an article for consideration? Please remember that responses to these documents (which should not be limited to responding to their very limited focus) should be sent in from CLPs by 8 June. Posted in: Labour, Left Futures, Politics. I’ve read the email and been to the site(s) and I can see nothing that insists responses have to come from CLPs. In fact the whole emphasis seems to be on individual members submitting their ideas. The email says “It’s easy to share YOUR ideas” and the NPF “…will consider all the submissions YOU make..” (My emphasis). On the pages themselves they talk about “..share YOUR ideas in a submission…” (Again my emphasis). As the author says time is short, don’t wait for ward or CLP meetings, just submit your policy ideas to the forums. I think this is very undemocratic (and will be making that point in response to the 2nd part of AE’s email), but it’s the way the system works, so lets make it work to our advantage. I know that I have put down a lot of information but it is stuff that anyone hoping to influence Labour policy must take in and respond to. When I wrote a similar piece two years ago there was very little response. If that does not change in the new situation of the Labour Party then the right wing will dominate policy. We need to discuss this material as a matter of urgency. We need to help each other to find a way of responding effectively. This is a useful summary of the NPF documents, thank you David. The problem though for me at least is that as someone who does want the NPF abolished I always feel between a rock and a hard place with this type of stuff. On the one hand the way the NPF process works makes me feel that comments are useless as who takes any notice of them and so why give this farce any more than the little legitimacy it has already? On the other hand to not comment allows the crap contained in much of the documents to go through uncontested and then where does that leave Conference when it comes to voting on them? Personally I will be looking at education as the privatisation and ending of local democracy via academies in England along with the near collapse of early years and post-16 funding is something that needs a real response and opposition. James, the thing is that whatever you feel about the NPF it is the body that we have at the moment. It will determine what goes in its report to Conference and that will define Labour policies. So better to get stuck into it. The right of the Party will do so. Does the left want to hand victory to the right because it doesn’t like the process? I fear that that is exactly what may happen. Secondly, I understand your negative feelings about the NPF (I have them myself) but I would ask you to consider the alternatives. Annual Conference is not an appropriate forum and does not have the means for detailed discussions of the wide range of issues that need to make up Party policy. Policy needs to be developed throughout the year. We need a body to act as a focus for that. The answer, in my view, is not to abolish the NPF and rely on Annual Conference. That just will not work. We therefore need either to reform the NPF or to create and alternative body with similar functions. We should not let our views about the manipulation of the NPF by the Party managers and the right of the Party cloud our judgement about its necessity (or that of a similar body). We need to get stuck into the process and assert ourselves. I just wish that I were confident that there were sufficient people on the left prepared to do the work that is involved. It is depressing, to say the least, that over a day after this article first appeared mine is the first comment. This is now, along with the elections and EU referendum the most important item facing the party, as it is about how we determine policy in this and subsequent years leading up to 2020. David’s article is an excellent summary of what is wrong with the various papers and how they fail to focus on the ‘big picture’. There is no point, for exzample, in having detailed policy on mental health, important though that is, if we do not have policy for the NHS as a whole. I do not understand why such ‘big picture’ documents cannot be produced. We surely have the expertise to do that. We certainly need a document on the economy, based around the ‘left Keynesian’ work that John McDonnell has been pursuing, including ‘Peoples’ QE’ and a National Investment Bank;on housing where some good work has been done which is not reflected in the paper which outrageously seeks to justify failure in this area under Labour; this should include anti hoarding powers, rent controls and tenant security;on educationwhich should include the role of local authorites and academisation, as well as tuition fees;on health and welfare, to include privatisation and personal care; and on energy, benefits, tax, defence, foreign policy and democratic reform.We sshould discuss alternatives, but indicate the likely road of travel. we must not repeat the error of saying nothing for fear of being criticised. The left has policies, but these must be developed, or the right will seize the initiative. Motionss to GCs in May to meet the June 8th deadline are essential, so get writing! This is a very valuable summary of the state of policy making and is much welcomed. However where do you begin? It cannot be considered as a real attempt at consultation. The superficial treatment of many subjects hardly provides an adequate base upon which to make amendments or add criticisms. With each section I feel the need to tear it up and start again. With the number of activities at the moment I hardly feel able to do justice to a rewrite. Surely this time scale is not just slackness it must be intentional in inviting contributions from only those preprepared documents. The timescale for me is to take this material for development one year down the line. Serious work needs much longer to get right and the authors are surely aware of what they do? Verity, you say “With each section I feel the need to tear it up and start again”. So do I. Do it. Or at least take at least one paper and do it and encourages others to do the same on other paper. We need to send in a massive response. Turn your ideas on one of the papers into an article for Left Futures. Lets have a discussion on each topic area. The important thing, in my view, is not to restrict ourselves to the material in the papers but to put in the broader political issues within which these narrower problems need to be viewed. Get scribbling. Yes David and well done for reading all of this and for summarising it. I guess a few of us are a bit ambivalent about the NPF as we know if was a fig leaf used by top down New Labour to give the impression of member democracy whilst completely ignoring the reports, but the reports will be taken at Conference. In response to your post I did go on Labour’s website and it took ages to find them but I read them all and they are dull and safe. I was going to make my own submissions on-line but forgot my password and tried to reset this but to no avail so have asked for guidance but at present I am locked out Ha!Ha! But unions etc and branches and CLPS should be discussing these and sending submissions in but I doubt if some will and as you say there is only a few months. As activists if we are honest we are often time poor (and not everyone can make evening meetings) but I wonder as well as trying to do this through the usual channels if Momentum could use this as a pilot to model how a local bottom up Momentum group could work? The documents are bland but I guess should be used as stimulus response documents. Perhaps local Momentum Groups could hold a Saturday morning mini-summit in their area on the 7 topic areas say from 10.000am until 1.00pm or 1.00pm until 4.00pm. And Momentum members should be asked to read the brief reports before attending to save time. Momentum members who can’t attend could send their points by email and these could be printed and put on spreadsheets and given to attendees to also consider at the summit. The attendees could then sign up for one of the 7 topics that interests them the most then in 7 small working groups develop a left wing submission on the topic for the first hour or so. Then the whole sumit reconvenes and each hopefully by then more left wing submission is read outloud with everyone having a chance to amend it further until we reach a majority view on each topic and these would be sent off. It could work and it could even be exciting. Perhaps Momentum could use this to trial how we would really like a grassroots, bottom up, participatory, left wing, democratic socialist Labour to be. Just some food for thought and in the meantime I will try to attend Labour meetings (difficult although I have been out since December helping in 2 wards) and I will persevere online. By the way an old Leftie once said to me many years ago that the Left should help in campaigns and elections so the Right couldn’t criticise them and the Right in Labour will use the local election results if they aren’t favourable as a stick to beat Jeremy with, so join us brothers and sisters; it is certainly an interesting experience and plenty of solidarity from your co-workers! Just an afterthought but if each policy could be ten or less bullet points or so then there is nothing to stop them also being circulated and used as Annual Conference Resolutions as Peter mentions before the 8th of June deadline. Bazza, not sure why you searched for the documents on the Labour website. Links are provided to all of them in my article. Frankly, I wouldn’t bother with submissions on Your Britain. There is no evidence that this is anything other than a pressure valve for people to let off steam to no effect. What counts are motions and papers from CLPs and affiliated organisations. I agree with your view of the motivation for setting up and organising the NPF but I think the answer is to take it over and make it work for the members. Be that as it may it is all we have to work with right now. I like your ideas about getting Momentum groups to take these papers on. It is on the agenda for my local group next week. I don’t think Peter suggested dealing with the problem in the form of Conference resolutions. That is not an option since it is only “contemporary motions” that can be taken and very few of them. This is explained in the legal section of Membersnet (where else!). Thanks for thinking of ways to put a bit of momentum(!) into these policy matters. It would be helpful if you explained your claim with examples and indicated why you think they would be contrary to EU law. Why the emphasis on sending submissions via CLPs? There is nothing in the Angela Eagle email that says this and the website where the documents are posted talks about posting YOUR comments. I think the way the NPFs work gives too much influence to individuals and is very undemocratic, but it is what it is. If people have submissions to make, by all means try to get them adopted by your CLPs, but also submit them direct to the NPFs. I did try to explain this earlier but probably didn’t spell it out enough. If you make individual contributions via Your Britain they have no particular status. They are alleged to go to the appropriate Policy Commission (for which we have yet even been given the names of its members) who will give due consideration to your thoughts. There is no feedback mechanism. You just have to hope that someone somewhere is listening. 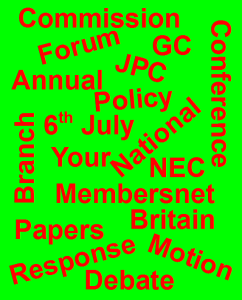 If you get responses from your CLP they will be on the papers given to NPF delegates at its July meeting and they will have to be considered. Most CLPs don’t rise to this challenge. It would make a clear difference if many did and if they supported policies that point in left direction for Labour. David in my job which I have done for 16 years I have had to learn forward planning. I put in my diary 6 months ahead that I need to do something for 3 months later and it is a brilliant life skill and I am dangerously organised Ha! Ha! So yes reform the NPF but if I was Gen Sec they would meet from Sept – Jan then send reports to CLPs, trade unions, affiliates by Feb, and they would be asked to carry out consultations on these in the next few months on the lines I suggested to get their comments on to meet the June deadline and it would be done! It’s now 12th May and this is the first I’ve seen of this and I guess many new members of the Party are in a similar fog as to how the NPF and policy making work. Our branch hasn’t met in March or April and no word of a meeting in May. Traditionally apparently they don’t meet during an election campaign but I am also suspicious that this is an attempt to scupper us formally discussing the documents and responding. I will however be going to the NPF roadshow on the economy on 20 May so look forward to contributing to the debate then.